I recently acquired a Porsche Boxster 2.5 as a project but with a house move, new baby car to sort out, all the other cars and a baby on the way, I just can’t juggle as well. It’s an arctic silver Boxster with terracotta interior, amber indicators on the 17” 5 spoke twists. It is the original Boxster Challenge PlayStation game specification which I had been looking for but I think I got a bit excited, annoyed the wife and realisitcally, just don’t have the time to sort it. I did my usual inspection on the car and I thought this was good enough to buy as I saw the potential in the good base, my plan was to restore it to great condition by getting a blow over, wheel refurb and giving the interior a good detail, simply for something to keep me busy over the cold months. It has cruise control, wind deflector, aftermarket headunit, digital climate control. 4 spoke steering wheel, no speakers in door card spec. I haven’t touched it at all as yet and it does need some love. The previous owner was an Italian guy, loved the car but just didn’t know cars and how they worked. It was kept in his underground parking at his flat where my friend lived, just down the road from where I live which is how I came across the car. It drives lovely, starts well, stops etc, mechanically, good order. The mileage is 86,600 odd and I can’t see a reason to not believe that. The radiators and condensers look in good condition and must have been changed at some point as they look perfect and clean. It had a new water pump in November. Engine sounds smooth and runs as expected. Roof is stuck, won’t go down on the button, the roof deck looks to have been pulled inwards so isn’t flush with the body so it looks like the motors need to be wound back, I looked in to this and various forum threads seem to think this is an easy enough job to sort. You undo the roof latch and the windows drop, you can hear the motors try to move but nothing happens. Wheels are scuffed, no major kerbing, just scuffed all over some how. Has coloured crests but they’re past it. The passenger front wing, door and bonnet have had a blow over at some point and in certain lights, you can see scratching under the paint. The passenger side of the car looks like it has been driven through a bush with a bunch of constant straight scratches down the entire side. The passenger rear quarter edge, where it meets the bumper has a deep scratch and dent. Has the usual rattle from a cat heatshield, I might have a moment to sort that with a new bolt or jubilee. Other than that, the body is straight, no rust and honest. For me, I wanted an early spec Boxster that was mechanically good, this is, it just needs a bodyshop, wheel refurb and a decent interior clean to be a great summer toy. I would say it would make a great track car but as a project, it can be a great road car again. The brakes are all 50%, front tyres are 5/6mm and tears are 3mm, all 2015 Michelin’s. The car comes with 1 working remote key, NO service history (FFS!!) but some odd receipts for bits the previous owner did. He said it was a repossessed car at some point hence no books/history, mot history can be checked online and seems honest enough. 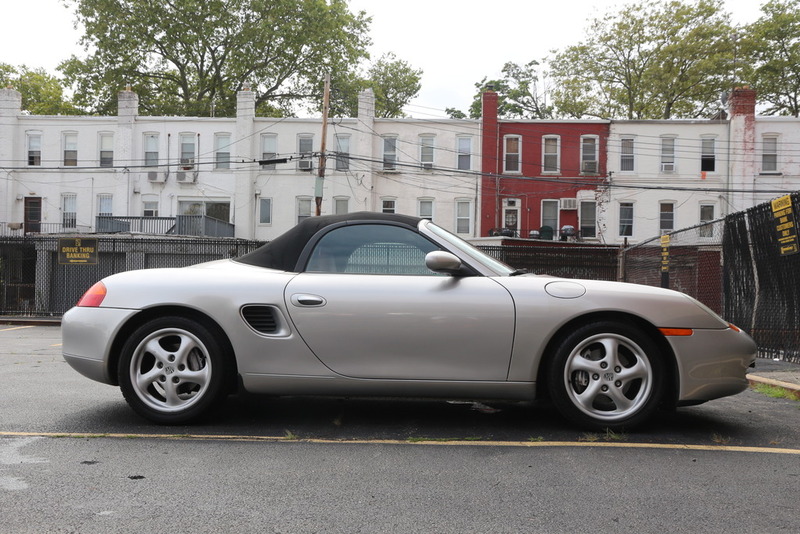 Like with my Boxster 2.7, it came with no service book but I was able to track it down by contacting porsche, i will get on the case with doing the same with this car this week. I am about to go away for a week so hopefully I will have discovered it’s history from a dealer once I’m back. I will upload pics when I get to a PC. It is a project, it’s not mint and not something I would usually sell given its current condition but I just haven’t got the time to get this upto my standards right now so I need to pass it on. I haven’t even had time to give it a thorough wash and polish so it is as I got it! Possibly the cheapest Boxster in the UK right now at £3k? I paid £2900, replaced a brake light switch, filled it up and insured it. It also has a private 5 digit plate with similar examples at £399 on the DVLA site. Porsche, as always, responded to my email straight away and delivered some good news. They have service history of the car up to 2006, 44k miles, which is good as this ties up with the online MOT history, so the mileage can be verified as genuine with all of this. I will get a genuine service book and have that stamped if they do it by post. The first 5 services were done by Porsche Hatfield and the 6th, Porsche West London.